Prepare to uncover the mysteries of the Mining Dynasty in Ainsworth's Oriental themed video slot. If you are brave enough to enter the Ming Empire and take on a mission to spin reels, then Ming Warrior is here with some goodies for you. This game is based on a mysterious ancient Chinese history. There are free spins, multipliers and other symbols to help you in your mission. 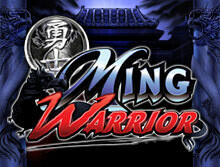 Ming Warrior is an action-packed video slot with high volatility and a theoretical return to player of 93.88%. The slot is played on a simple layout of 5 reels, three rows and 20 pay lines and you can see ager from $0.01 up to a maximum of $2000. Ainsworth has used state of the art graphics and excellent sound effects to offer a great gaming experience. You can choose to become a Ming Warrior and take up your mission from your smartphone, tablet or desktop from wherever you are. 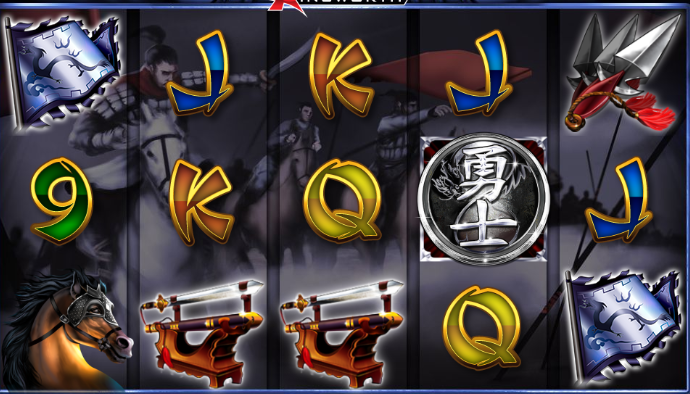 Ming Warrior video slot has a very detailed and attractive design. If you didn't know, the Ming Dynasty was an empire that ruled a significant region in China between 1368 and 1644. The empire was well known for social and political stabilities in Asia. Also, the Ming Empire saw the opening of the Far East of Asia to new business partnerships with India, Africa and even the Arabic world. Inspired by the Empire of the Great Ming, Ainsworth developers released their amazing slot game. Ming the Warrior is lurking outside an old tomb on a secret mission to unravel some hidden treasures. As the game loads, you will see a bold Gothic style backdrop with a venomous serpent coiling around pillars erected on either side of the reels. Ming Warrior comes with simple and straightforward rules to play. As mentioned, you will play with 5 reels, 3 rows and 20 pay lines, and you will find several exceptional features like free spins and multipliers to boost the chances to win. Stake from a minimum of 20p up to $2000 to join the great battle. You need to set your wager before you start playing. To do so, click on the (+/-) signs next to the Spin button. Click on the Gear icon in the bottom left corner to adjust the number of lines and to access more information about the paytable. The spin button will enable you to set the reels in motion, and the bold + icon next to it is the Autospin button. Click on it to set up to 100 auto games. The symbols used in the game match the theme, and they will aid you to form winning combinations. They are marked by the traditional card symbols which are designed to have a Chinese style. Of course, the themed symbols have higher payouts whenever they appear on the active reels. The horse is the highest paying symbol, land 2, 3, 4 or 5 of the kind and you will be rewarded with 5, 50, 100 or 1000 coins specifically. The warrior represents the wild symbol and he can replace for all other symbols on the reels except the scatter symbol. The Warrior will show up on reels 2, 3 and 4 during the paid games only. The Coin is the scatter symbol in Ming Warrior slot. You need to land three or more scatter symbols to trigger the Free Games feature. Land three or more Coin scatter icons to activate either Free Games Feature 1 or Feature 2 randomly. Free Games Feature 1: 10 free games will be rewarded and will pay double (x2) if one or more Warrior substitutes win. Free Games Feature 2: 10 free games will be awarded, and the win will be multiplied by (8x) if one or more Warrior symbols win. Play Ming Warrior Slot On the Go! Being a slot from the leading mobile video slots developer, Ainsworth, you expect Ming Warrior to feature excellent visuals and flawless gameplay across all platforms. This slot is built with the modern cutting edge technology which enables it to retain HD graphics on smartphones and devices. Ming Warrior is available in instant play mode, as such, you dont have to worry about downloading apps on your device. Australian based provider, Ainsworth Game Technology is one of the most reputable slots creators in the UK. The developer has earned a name for providing HTML5, and Flat enabled video slots, and Ming Warrior is one of them. The reason why the company is top-rated despite joining the online industry in 2013 is that its owned by Len Ainsworth, the industry's most celebrated developer and also the owner of Aristocrat Gaming company. Also, the company is in partnership with giant game developers such as Microgaming, Playtech and NetEnt. Other popular titles from the developer include Dragon Lines, Winning Wolf, Cash Cave, Mustang Money and Jungle Monkeys. We are the only UK online casino designed with the player's mind and for players. We are committed creating and maintaining a great user experience that is unique from the congested market. But what makes us different? Our vast slots game collection and other casino game variations like blackjack, roulette, baccarat, video poker, and live dealer games will keep you thrilled all through. We offer games from several software developers like NetEnt, Elk Studios, Evolution Gaming, Nektan and Thundekick who utilise modern cutting edge technology to deliver unique games. Mobile gambling is the latest trend in gaming; as such, our site is fully compatible with smartphones and tablets powered by Android and iOS. Our developers use HTML5 technology to craft mobile slot with high-end graphics, fast loading speed and a wide range of bonus features. Our casino bonuses and promotions benefit both new and regular players. To our new customers, we have a decent matchup bonus of up to $1200 welcome bonus and 100 free spins. We also reward our regular customers with loyalty points called "bPoints". This will enable you to rise through different VIP where you will receive several exclusive offers. You will be lost for choice when it comes to our payment options; our site supports safe and widely accepted deposit and withdrawal options like Credit and Debit cards, eWallets and Mobile payments. We pride in offering unparalleled customer support service with our highly trained and experienced agent via email and live chat 24/7.